Talk about times we face during the day that can be difficult and when we’d really like to know God is with us. Or, when we are on our own and feel lonely? God is always there, but it can be hard to remember that when we can’t see him! Take a safety pin and pin it somewhere on your clothes as a reminder that God is always with you and keeps you safe. You might prefer to put it somewhere where no one can see, or you might have it visible as a potential talking point! 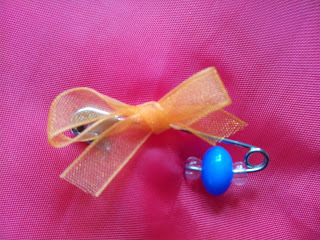 You might even want to personalize the safety pin with a couple of beads or a small strip of ribbon. This is a great way to reassure your kids or yourself on scary or difficult days.